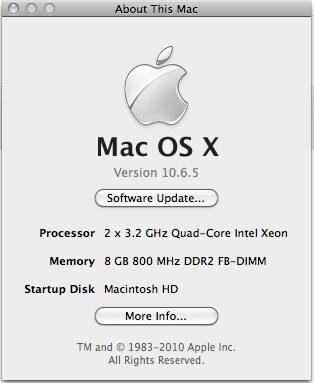 CUNY provided me with a new Mac Pro, check out these specs baby, so I thought it might be neat to document what it takes to set it up from scratch. For the last six months, I’ve been working regularly on four different Macs. At home, I have a MacBook and an iMac, and at work I’ve had a MacBook Pro and an iMac. To keep the system environment similar, I’m a reluctant user of MobileMe. It has its downsides, but it’s really the simplest way to sync everything from my contacts to the icons in my dock. For some applications, I’ve noticed it will even sync your license. Authenticating the machine against MobileMe is the first step I take.